The protective nose cone of an Orbital Sciences Corp. Taurus XL rocket carrying NASA's Glory environmental research satellite apparently failed to separate after launch Friday, preventing the spacecraft from achieving orbit in a $424 million failure. "All indications are that the satellite and rocket is in the southern Pacific Ocean somewhere," NASA Launch Director Omar Baez said in a morning press conference. It was the second nose cone failure in a row for a Taurus XL rocket following the 2009 loss of another environmental satellite, reports CBS News space analyst William Harwood. "I think it's not an understatement to say tonight we're all pretty devastated," said Ronald Grabe, a former space shuttle commander who now manages Orbital's Launch Systems Group. "But we will recover, the team will bounce back because they're all professionals. Orbital Sciences will bounce back with the Taurus vehicle." Delayed since Feb. 23 by trouble with ground support equipment, the Glory mission got underway at 5:09:43 a.m. EST (GMT-5) with a sky-lighting launch from Vandenberg Air Force Base, Calif. The first two stages of the slender four-stage solid-fuel booster ignited normally, with the second stage firing up on time two minutes and 45 seconds after liftoff. Six seconds later, the two halves of the clamshell nose cone fairing were supposed to separate, pushed away by pistons driven by pressurized nitrogen. "We are at T+plus 300 seconds," Richard Haenke, the ascent commentator, reported. "The vehicle speed error is indicating underperformance, which is expected due to a fairing not separating. We have a report the system did pressurize. However, we still have no indication of the fairing separating." 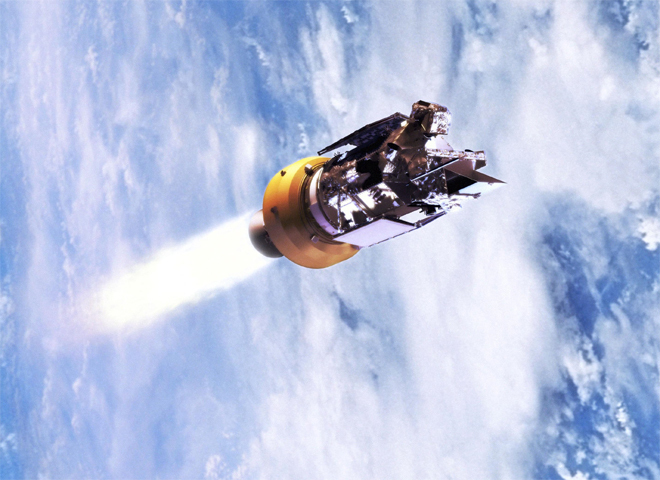 The additional weight of the nose cone fairing prevented the rocket from achieving its planned trajectory and a few moments later, Baez declared a failure. "We have had a contingency on the Glory mission," he told the launch team at 5:15 a.m. "Please enact the mission mishap preparedness and contingency plan. Begin with notification, data impoundment and mishap response tasks. Do not leave your stations until released by the NLM (NASA launch manager) or the ALM. Do not attempt to call out and release information to anyone or speculate on the cause of the contingency." Hal Getzelman passed the news along to the International Space Station's crew during a morning tagup with mission control in Houston. "Good morning everyone, the plan's on board," he said. "Just one news update. About an hour ago, NASA Glory Earth observing spacecraft was launched and failed to achieve orbit today when the payload fairing did not separate." "Oh, sorry to hear that," station commander Scott Kelly replied. "That's unfortunate." At a post-launch news conference, a visibly subdued Baez stated the obvious, saying "it's a very difficult situation we're in here." He said the countdown and pre-launch processing went smoothly, with no indications of any problems. "But we failed to make orbit," he said. This was the second failure in a row for a Taurus XL rocket. NASA's $273 million Orbiting Carbon Observatory was lost during launch Feb. 24, 2009, when it suffered a similar nose cone fairing failure. Orbital Sciences redesigned the system in the wake of that failure, replacing a hot-gas pressurization system with more robust pressurized nitrogen system borrowed from the company's Minotaur rockets. "This is a pretty tough night for all of us," Grabe said. "A little over two years ago, we had a similar tough night when we conducted a Taurus launch for the OCO mission. That mission suffered a failure ... of the fairing to separate. We conducted an extensive investigation of that anomaly and we traced the most probable cause to a failure of the fairing separation initiation system. "We spent the last two years doing the analysis on what went wrong the last time, redesigning the system and testing the components of the system. We went so far as to completely change out the initiation system to a system we use on one of our other vehicles, the Minotaur 4. And in the intervening two years, that system has flown successfully three times. So we really went into this flight feeling confident we had really nailed the fairing issue. And then we came up with the results Omar described." Rich Straka, deputy general manager of operations for Orbital's Launch Systems Group, said the rocket featured additional sensors to provide more telemetry, which should help engineers pin down what went wrong. But he said it would take several hours to complete a preliminary review of the data. For NASA, the second Taurus XL failure in a row drove losses to nearly $700 million. "Clearly, the science mission directorate and the whole science division is extremely disappointed in the loss," said Mike Luther, deputy associate administrator for science operations at NASA headquarters. "We had worked closely at all levels of the agency and with our industry partners to evaluate this risk and we felt going in that we had an acceptable level of risk. Clearly, we missed something. "We've now got to go off, find out what that is, fix it and that is, in fact, what we will do. In the meantime, we've lost the Glory mission. It would have made important measurements for the understanding of Earth as a system and the impacts of climate change. However, (NASA) will continue to contribute and make significant contributions to the understanding of the Earth with its 13 existing missions and a cadre of aircraft, ground networks and data systems contributing to Earth science research." The 1,200-pound solar-powered Glory spacecraft, also built by Orbital Sciences, was designed to precisely measure how much solar energy enters and leaves Earth's atmosphere and how small particles called aerosols, both manmade and natural, affect the global environment. The satellite's Total Irradiance Monitor, built by the University of Colorado's Laboratory for Atmospheric and Space Physics, was designed to monitor the sun during the daylight portion of each orbit to provide six-hour and daily averages of the total solar energy coming into Earth's atmosphere. The Aerosol Polarimetry Sensor, built by Raytheon Inc., was designed to measure "the size, quantity, refractive index and shape of aerosols," according to the mission website. "This is the first space-based instrument to be able to identify different aerosol types, which will help researchers distinguish the relative influence of natural and human-caused aerosols in our global climate."